President Obama didn't fail because he lacks courage. He failed because he represents the country's most powerful interests. So why did things go so wrong under the leadership of President Barack Obama? David Bromwich has written an informative and important critical article on the Obama presidency — critical, one might say, from the progressive point of view — titled “What Went Wrong: Assessing Obama’s Legacy,” which appears in the June issue of Harper’s. Fundamentally, Bromwich sees Obama as a weak president who has consistently pursued the “path of least resistance” rather than the “path of courageous resistance.” He was, says Bromwich, a president who mistook talk for action, who avoided political conflict and struggle, and who missed opportunities that presented themselves, moments when he might have advanced a progressive agenda. At the same time, he did not communicate to the public, did not argue for his positions on health care, Iraq, Syria, or Iran. Yet he took great pride in his friendship with Wall Street bankers. Bromwich’s article leaves us with the impression that it was this basic character flaw — weakness and lack of courage — that accounts for the Obama administration’s failures. Bromwich produces quite a list of the administrations problems: Obama’s failure to take advantage of the Democratic Party’s congressional majority during the first two years of his first term to press his agenda. His failure to close the prison at Guantánamo. His failure to get out of Afghanistan when the opportunity presented itself. The failure of his Iraq policies. The error of putting Larry Summers at the head of his economic team. His expansion of the drone war. The dropping of Palestine from his agenda. The confused humanitarian intervention in Libya. Foreign policies in Honduras, Ukraine, and Venezuela that seemed to escape his control. The bureaucracy he refers to are the NSA and the CIA; the 2,000 private companies and 1,300 government organizations employed in counterterrorism, intelligence and surveillance; and the 854,000 Americans with top-secret security clearances. At the end of his essay Bromwich seems to suggest that Obama held the title while they governed, a point of view that lets the president off the hook, fails to hold him personally responsible, because he was so damned weak. Bromwich is no doubt right that there is a Deep State — but it is not only the military and intelligence establishment. It includes the party leaders, Republican and Democrats, and their top fundraisers and consultants. The problem with Bromwich’s article is that it fails to recognize that weakness and lack of courage are also political choices. While it may be true that Obama preferred to talk rather than to lead political fights, organize and administer government, or follow through on his various proposals, still he chose those to whom he deferred. 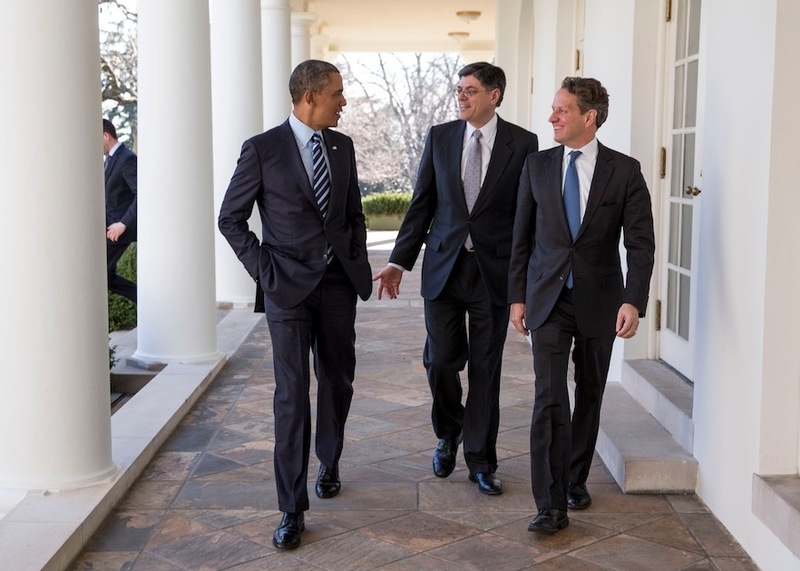 But Obama made the choice to place Larry Summers in charge of his economic program and to make Timothy Geithner and then Jacob Lew of Citigroup secretaries of the Treasury Department. Obama made the choice to keep on George W. Bush’s secretary of defense, Robert Gates; his three other appointees — Leon Panetta, Chuck Hagel, and Ashton Carter — were, of course part of the military-industrial establishment. That is, Obama made the choice to turn over government to the banks, the corporations, and the military establishment that have historically formed the Deep State. There have been other presidents who were weak and lacking in courage. One thinks of Warren Harding, who sat in the chair but let others equally conservative, but more corrupt, and more politically vicious, do the work of embezzling from the government and crushing the labor unions. Harding was no doubt a fool, but no matter whether a president is as foolish as Harding or as brilliant as Obama, the decision to let others governs, others who represent the interests of capital, militarism, and empire, is the president’s. Obama not only chose the path of least resistance, he chose the path of acquiescence to those powers, but he chose it years before he became president. He chose, and he is responsible. Republished from New Politics . President Obama didn’t fail because he lacks courage. He failed because he represents the country’s most powerful interests.